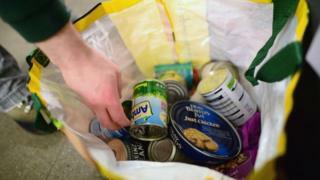 A "record number" of people received aid from UK food banks in the last year, a charity has said. The Trussell Trust said three days' food was given out 1,084,604 times in the 2014-15 financial year, though it is not clear how many people got help because some visited more than once. It is a rise of 19% on the previous 12 months - and Labour's Rachel Reeves called it a "shocking" increase. The Conservatives said their economic plan was the best way to help families. The Trussell Trust said more than a third of the aid given out by its 445 food banks across the UK went to children. It describes itself as "a charity founded on Christian principles", and runs its network of food banks in partnership with churches and communities. Care professionals such as doctors, health visitors, social workers, the Citizens Advice Bureau and the police identify people in need and issue them with a food bank voucher. The Trussell Trust's figures do not include food banks run by other charities and churches. No-one knows the exact figure for food bank use in 2014-15. What we know is the Trussell Trust says its food banks - which are not the only ones out there - gave 1,084,604 people three days' food. But any occasion when a person received the food counted - so a person who came in twice would be counted twice, and so on. If a family got food, each member counted. The trust says that "on average 49% of food bank users only needed one food bank voucher in a year", so that half of users should add up to more than half a million people. How many times the others received the emergency food boxes is hard to tell, though the trust says only 15% "needed help more than three times in a year". The point, the trust says, is that "significant numbers" of men, women and children are going hungry. Problems with benefits was the main reason people visited food banks and there had been an increase in those on low incomes seeking help, the trust said. Food bank managers reported dealing with people struggling with insecure work, low pay and high living costs. Trussell Trust UK food bank director Adrian Curtis said the charity's facilities were increasingly hosting additional services including debt counselling and welfare advice. "The Trussell Trust's latest figures highlight how vital it is that we all work to prevent and relieve hunger in the UK," he said. "It's crucial that we listen to the experiences of people using food banks to truly understand the nature of the problems they face." Carmel McConnell, chief executive of the Magic Breakfast charity, which delivers food to schools, said there had been an increase in the number of requests for urgent deliveries. Oxfam head of UK poverty Rachael Orr said the figures were "extremely worrying". Unite general secretary, Len McCluskey said the new figures revealed a "scandal of epic dimensions". "Something has gone grotesquely wrong when so many people, in and out of work, have to turn to charity to feed their children," he said. "One family failing to make ends meet each month is a family too many," a Conservative spokesman said. "The best way to help families provide for themselves is cut taxes and to get more people into work and there are already two million more people in work since the election." Labour's Ms Reeves said it showed the "Tory plan" was failing. "David Cameron's failure to tackle low pay, the bedroom tax and delays in benefit payments have led to over a million people depending on emergency food aid," she said. "Labour has a better plan to raise working families' living standards so fewer people depend on food banks to survive." Green Party leader Natalie Bennett accused the other political parties of being "chained to their slogans about 'hard-working families'" while failing to tackle poverty. In a speech at Sheffield Students' Union she said: "It is the duty of government to ensure that our economy provides decently paid jobs for all those looking for work. "We believe that poverty is a result of political decisions - and that only a new kind of politics can overturn the race to the bottom on wages and benefits that we've seen for too long in this country." Correction: The Trussell Trust has clarified that its earlier figure of more than a million people using food banks actually referred to the number of times food was given out.